Calcite is a carbonate mineral and the most stable polymorph of calcium carbonate. The color blue can occur when the mineral is charged with impurities. It also occurs as a vein mineral in deposits from hot springs, and it occurs in caverns as stalactites and stalagmites. 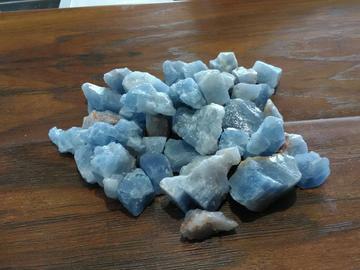 Blue calcite is a stone that is especially calming and soothing. Nearness of this stone is great for calming frayed nerves.